By: Erik Hyrkas on December 11, 2015. Is it under your coffee table yet? This is my favorite tablet joke. That’s because, like fitness trackers, after a few months most tablets end up sitting dead on, or underneath, people’s coffee tables. Is there really anything left to inspire us in the world of portable, flat screen devices? 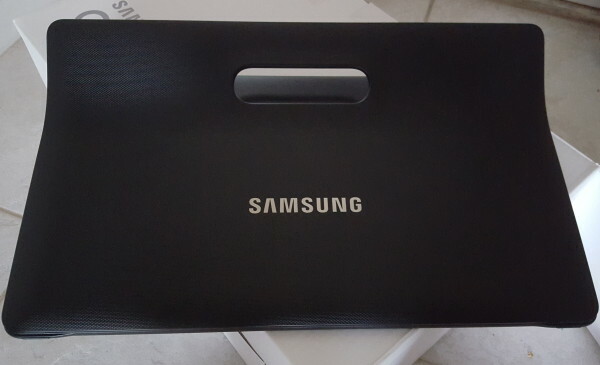 Do you really want a thinner iPad or and upgraded 10.1” Galaxy Tab? Well, perhaps, that’s not the question. Maybe it’s: How can we make a coffee table gadget bigger and more interesting? Samsung is attempting to answer exactly that with the 18.4” Samsung Galaxy View, the largest tablet we’ve seen with 4G on AT&T. Read on down to find our full review. Spoiler: I didn’t totally hate it. 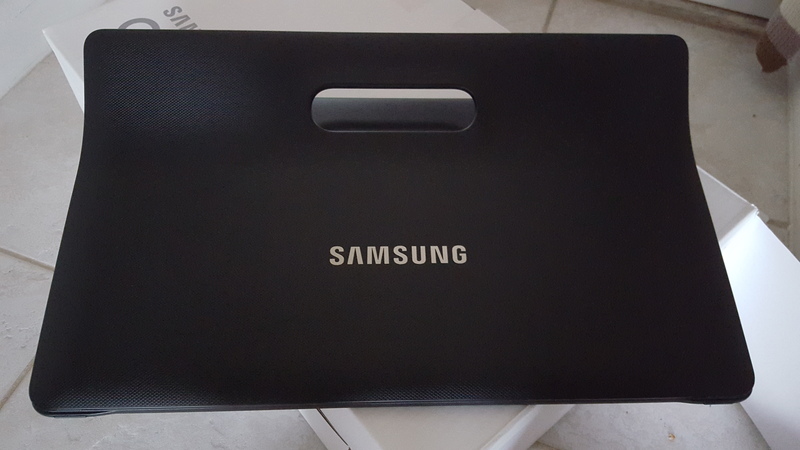 When I opened the Samsung Galaxy View, I laughed. The thing is atrociously large. 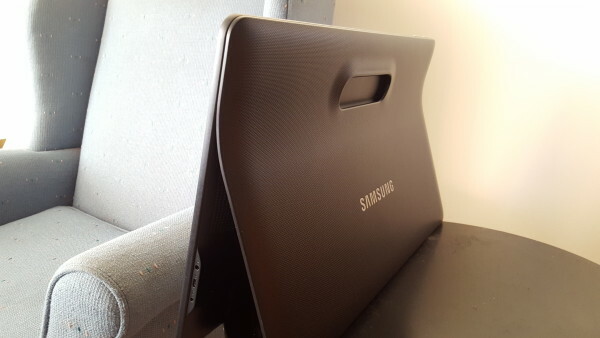 With its giant kickstand and 18.4” glossy screen, the View is basically a Microsoft Surface on steroids (or a Galaxy Note 10.1). You might as well use it as a mirror when it’s not sitting on your table. Paper weight jokes aside, the Galaxy View is a really attractive piece of hardware with some really uniquely leviathan-esque design. The product is so large it weighs six pounds (5.84 lb). That’s heavier than an average Macbook Pro, making the View a rather weird device in terms of purpose. During this review we spent a lot of time figuring out what to think of this device as. Is it a tablet? Should it be used as a television? Would you want to use this in bed? Or is it meant more for the kitchen? We’ll have more on that further down. The tablet’s structure is made using thin plastic with rounded corners and a good inch of bezel around the display. It comes in black and feels quite cheap compared to any tablet we’ve reviewed. The weight distribution feels uneven when in your hands. 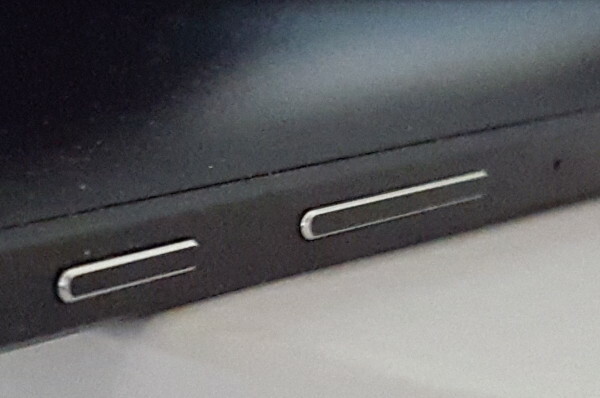 That’s because on the back of the device, a built-in kickstand sits. making it cumbersome to hold. This piece is also black but with a rougher, textured feel and look to it. The two-sided stand actually flips up and down on a hinge, allowing you to stand the device up or carry it around with its handle. In that way, one side of this stand always juts out. It’s a little alien. But this also makes it lie flat on a table or a bed without good stability for playing games. In any case, this device also isn’t made to be used specifically in your lap. 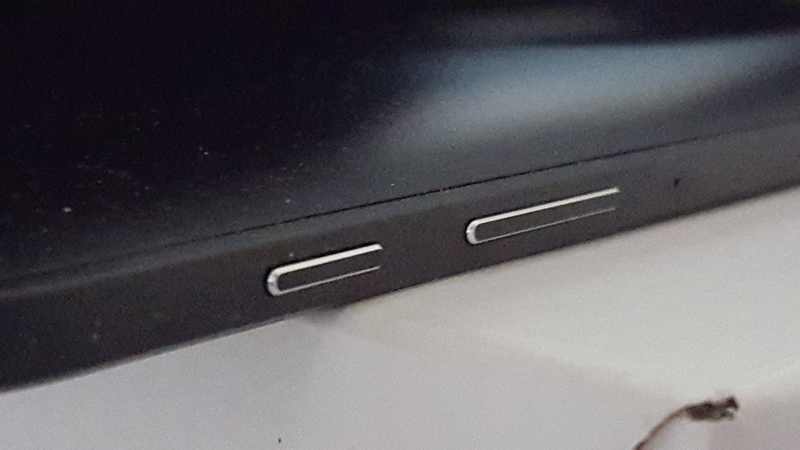 On the right side you will find the tiny charging port for an AC adapter charger that comes with the device, a microUSB port, and a headphone jack. Two stereo speakers can be found on the back of the actual tablet, and they’re engineered to bounce sound right back at the viewer. The power button and volume rocker sit atop the left side the device, and it’s the only way to wake it up when the screen has gone to sleep off. The 18.4” capacitive touchscreen display has 1080 x 1920 resolution with 120 ppi. While that sounds fairly low for a tablet, you have to remember this device is large enough you don’t have to hold it close to your face. Much like a TV, ppi doesn’t matter when you’re several feet away. If you want to see pixels, go ahead and look, but you won’t have to stare anywhere near the View’s glass with this much screen. Of course, viewing angles on this aren’t necessarily great either. The screen is terribly glossy and has poor viewing angles. But when looking at straight on, like you would a television, it’s perfectly enjoyable. Tapping the display feels weirdly cheap and flimsy compared to most tablets, yet swiping around and clicking icons is immediately responsive. However, this is still an odd product to use. It feels more like you’re playing with a new art exhibit than it does an iPad or traditional Galaxy Tab tablet. The Galaxy View comes with Android Lollipop 5.1.1 and keeps Samsung’s most recent version of TouchWiz. If you’ve ever used a Samsung phone, you’ll immediately feel at home in this environment. Settings customizations are simple and few and the notification bar swipes down from the middle. Navigation is intuitive, fluid, and completely lagless. An added bonus for DirecTV/AT&T customers is the addition of DirecTV’s app. This means you can watch all your favorite shows and movie channels on your Galaxy View in addition to your home satellite hookup. As a reviewer, this was an incredible perk. I watched new HBO and Showtime content with a tap of an app. Of course, it’s also not much different than using Xfinity’s On Demand application, or Netflix and HBO Go separately. Having access to Google’s app (formerly Google Now, RIP) was also was a real winner. Opening apps or searching for YouTube videos with nothing but “Okay Google,” felt like using my Android smartphone on something ten times its size. It was just natural, easy, and comfortable. Google Hangouts video chats were also brilliant on such a large display. It just felt nice to set up the giant screen on its kickstand and walk away while talking to people. The microphone is sensitive and the 2.1 megapixel, front-facing camera works like a charm. The ever-surprising thing about tablets is how no different they are from your smartphone. The View comes with an 1.6 GHz octa-core processor, Mali GPU, 32 or 64GB of internal storage, 2GB of RAM, and a hidden MicroSD slot capable of expansion to 128GB of external storage. That last bit was found hidden under a cover on the back of the tablet. 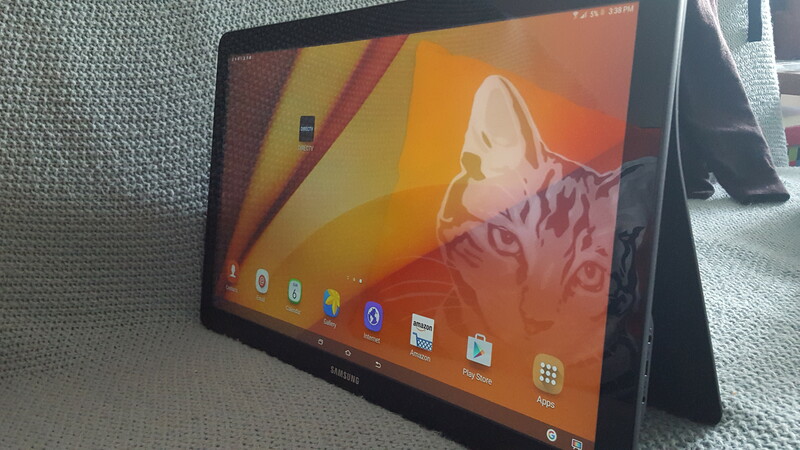 The tablet also has a 5700 mAh battery, Bluetooth 4.0, 4G capability, GPS, wifi, a stereo jack, and stereo speakers. This means the specs are not far off from the Galaxy Note 5 (aside the battery and display size), and that makes is a sleek, energy-efficient powerhouse. After laughing upon opening the Galaxy View, I couldn’t get enough of this device. Even just thinking about how I should use it was amusing. In the end, I first used the View watch films using DirecTV’s app. It works brilliant on AT&T’s built-in 4G; of course, that data ran up very quickly. Then I was relegated to my own shoddy internet, which made it less amusing. 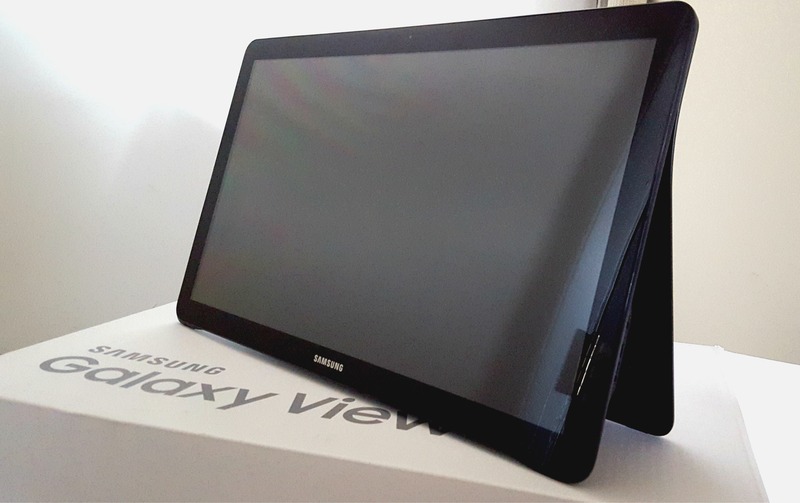 Picture, colors, and frame rate on the Galaxy View are fine, but it’s not going to wow you. If you consider this screen, while 1080p, has about 10% of the resolution/pixel density of your smartphone, you’re going to realize using it closer to your face is lame in comparison. In this way, the Galaxy View is definitely meant to be watched. with 18.4” of screen real estate, it’s not hard to use it 12” from your face and is best viewed even further away. 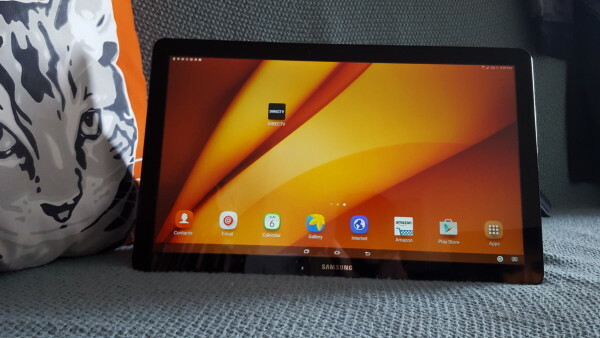 The Galaxy View is like a suped up Galaxy Note 10.1, which actually a fair comparison to the contrast between a Galaxy View and a Galaxy Tab. Samsung seems to constantly be building bigger devices with basically the same hardware involved. Larger screens, larger batteries, and yet the same or lesser specs in their flagship smartphones. It’s a weird idea, but it’s one that may actually target a new market of consumers. It’s something people can interact with, but don’t have to hold. Playing games and browsing apps like Reddit is Fun and Flipboard is a really amusing experience on 18.4″ of screen. You also get to use two-paneled apps because of this, making you feel more productive. It’s a rather eye-opening experience if you’ve been using all of your apps on smartphones for the past several years. Software developers have really done well to include multi-tasking options for those with tablets, and you can experience them in such scale with the Galaxy View it’s a very amusing experience. The Galaxy View comes with a large 5700 mAh battery and considering this tablet has no more sophisticated hardware than your smartphone, its standby time is absolutely ridiculous. 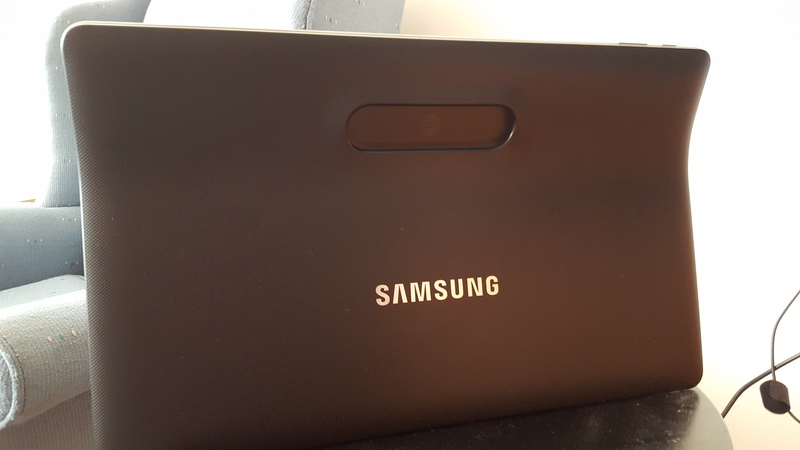 While Samsung rates it for eight hours of battery life, I was actually able to let the Galaxy View survive on standby for five entire days over Thanksgiving. This was incredible. So despite the View being a rather large, unportable object, it’s still something you can carry across the room or move about without worrying about cords getting in the way. That made its laptop-worthy battery perfect for at home use, especially in the kitchen. I really loved reviewing this product. The Samsung Galaxy View has so many enigmatic things about it. Something about the ridiculous size of the screen and the yet all the capabilities of a smartphone makes you just want to play with this thing. It’s also just an easy way to share media with friends and family without having everyone squint, figure out how to beam their screen to a smart television, or gather around a PC. However, the device still feels rather cheap and chinsy. I felt like the kickstand would break within a month of use and any drop of this device would assure a nice big crack in the glass if not absolute destruction of the screen’s digitizer. It also just felt a little lame to use in terms of touch feel, and the display could have been higher quality. And for $499, no one should feel that way about tablet, even if it is meant to mostly be viewed as a smaller television. Nevertheless, the battery life, ingenuity in design (i.e. the handle/kickstand), 4G capabilities, and general enjoyment in this product’s idea is something worth holding onto. Samsung has performed another grand experiment with the Galaxy View (think Gear VR), and I believe it is one that will absolutely be improved upon. The question for you is whether or not you want to pay for the first half-baked attempt. You can pick up a Galaxy View of your own for $499 and a new contract or $30/mo with AT&T Next on AT&T. As always, be sure to shop around. Last updated by Erik Hyrkas at September 13, 2016 .